NOTE: Note: The term GPG is used for all OpenPGP/PGP/GPG related material and implementations. Subkeys support was added in GitLab 10.1. 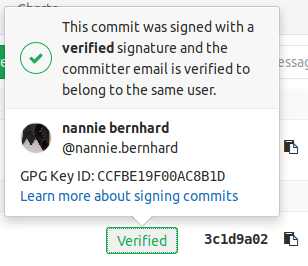 GitLab can show whether a commit is verified or not when signed with a GPG key. All you need to do is upload the public GPG key in your profile settings. GPG verified tags are not supported yet. GitLab uses its own keyring to verify the GPG signature. It does not access any public key server. Install GPG for your operating system. If your Operating System has gpg2 installed, replace gpg with gpg2 in the following commands. NOTE: Note: In some cases like Gpg4win on Windows and other macOS versions, the command here may be gpg --gen-key. Pick a strong password when asked and type it twice to confirm. Replace <your_email> with the email address you entered above. NOTE: Note: Once you add a key, you cannot edit it, only remove it. In case the paste didn't work, you'll have to remove the offending key and re-add it. On the upper right corner, click on your avatar and go to your Settings. Navigate to the GPG keys tab and paste your public key in the 'Key' box. Finally, click on Add key to add it to GitLab. You will be able to see its fingerprint, the corresponding email address and creation date. After you have created your GPG key and added it to your account, it's time to tell Git which key to use. Replace 30F2B65B9246B6CA with your GPG key ID. git commit -S -m "My commit msg"
Enter the passphrase of your GPG key when asked. Push to GitLab and check that your commits are verified. 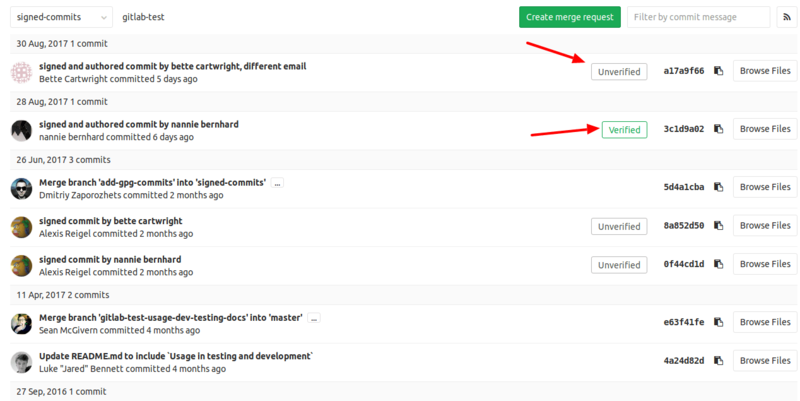 Within a project or merge request, navigate to the Commits tab. Signed commits will show a badge containing either "Verified" or "Unverified", depending on the verification status of the GPG signature. By clicking on the GPG badge, details of the signature are displayed. Revoking a key unverifies already signed commits. Commits that were verified by using this key will change to an unverified state. Future commits will also stay unverified once you revoke this key. This action should be used in case your key has been compromised. Navigate to the GPG keys tab. Click on Revoke besides the GPG key you want to delete. 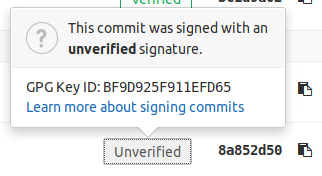 Removing a key does not unverify already signed commits. Commits that were verified by using this key will stay verified. Only unpushed commits will stay unverified once you remove this key. To unverify already signed commits, you need to revoke the associated GPG key from your account. Click on the trash icon besides the GPG key you want to delete. You can configure your project to reject commits that aren't GPG-signed via push rules. Learn how to get the GPG signature from a commit via API.